Hours: Picnic shelter/clubhouse are open 24/7. Comments: Picnic shelter with BBQ, sink/clean-up area & local phone. The water in bathroom is turned off in winter and the phone and WiFi are turned off until the end of April. The bathroom hallway will be under combination lock during the boating season and the combination will be in the kiosk. Restaurants: The Kingfish Dining Room (aka West Sound Cafe) is near the OIYC dock (closed in winter). There are many other restaurants on the island. 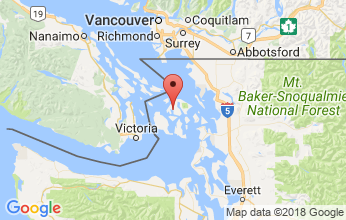 Other Information: West Sound is a full service marina adjacent to the OIYC reciprocal dock. 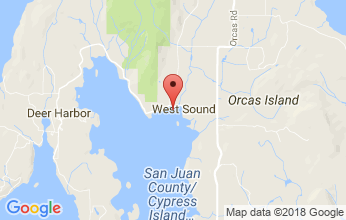 Location: West Sound, Orcas Island. All of the dock is reserved for reciprocal yacht club visitors except the East Side (Yellow Zone), which is reserved for OIYC members. Dockage: 200' - unattended. Fill west side and east side outside the yellow zone. 2 boats tied side-to-side is allowed. 3 or more boats tied side-to-side is not permitted. Please stern-tie when dock is busy. Restricted Dates: The entire dock is reserved for OIYC members for Opening Day (the first weekend in May) and for the round-the-County Race (the second weekend of November). Terms: Dock in front of Picnic Shelter. No Reservations. Tie up, then dock-box sign in. Fly your Burgee. Facility Comments: Picnic Shelter with local-only phone, big kitchen sinks, and bathrooms w showers. 2017 Restroom Combination will be 5577. Alternative Mooring Notes: West Sound Marina 360-376-2314 VHF16 info@westsoundmarina.com Anchor in 30-50ft w heavy anchor to break hardpan bottom. Mooring balls are private.